Neither day of the weekend looks all that promising for diving. The Atlantic is most likely to have the better visibility, however the swell on Friday and early on Saturday is not really my cup of tea. I will take a look at False Bay on Saturday, and possibly launch there on Sunday if it looks decent. 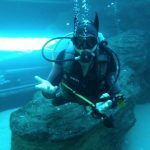 If you’d like to dive, let me know! 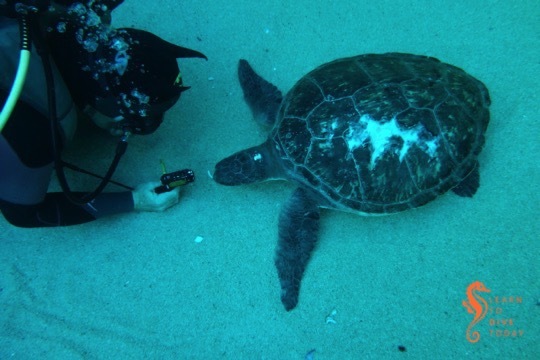 We are entering into the busiest time for turtle wash-ups on the Western Cape coastline. On Tuesday, 14 (yes, fourteen) baby turtles stranded themselves in Hermanus. These little animals are in a highly compromised state when they end up on the shore, as they can’t cope with the cold waters this far south. 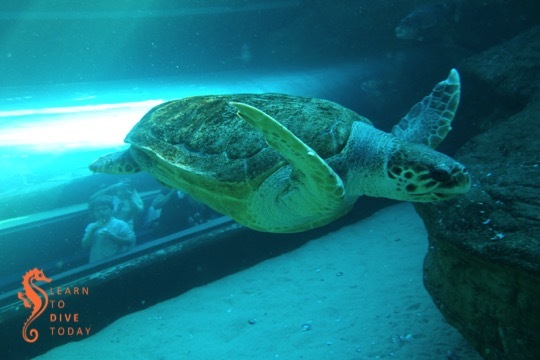 The Two Oceans Aquarium has a sophisticated turtle rehab facility, and, once they’re fattened up and restored to full health, the little turtles are released in the summer months when the warm current is closest to the Cape Peninsula coastline. Read about what to do if you find a baby turtle here. Local drop off points for tiny turtle guests are at the Two Oceans Aquarium (obvs), and the Shark Spotters info centre in Muizenberg. One of the things I love about False Bay, and about Long Beach in particular, is the tendency for creatures from all over South Africa’s coastline to end up here, often tropical marine life that got caught in the warm Agulhas current, and then within the circulation of False Bay, ending up just behind the Simons Town harbour wall. Thus it was, early in March, that we discovered several adult specimens of Smith’s swimming crab (Charybdis smithii) at Long Beach when we went for a dive. One or two were already dead, and the rest were struggling either on the sand, or in the shallows, looking unhealthy. The water temperature at the time was about 17 degrees. The first hint that this unusual and rarely-seen visitor had arrived on our shores was a series of social media posts, from January, in one or two of the fishing groups I follow on facebook. (These are excellent places to keep tabs on what’s happening in parts of the ocean I might not routinely visit, and there’s a wealth of knowledge and experience among the members.) Here’s a conversation between local fishermen about seeing large numbers of adult Smith’s swimming crabs just off Cape Point (also facebook). 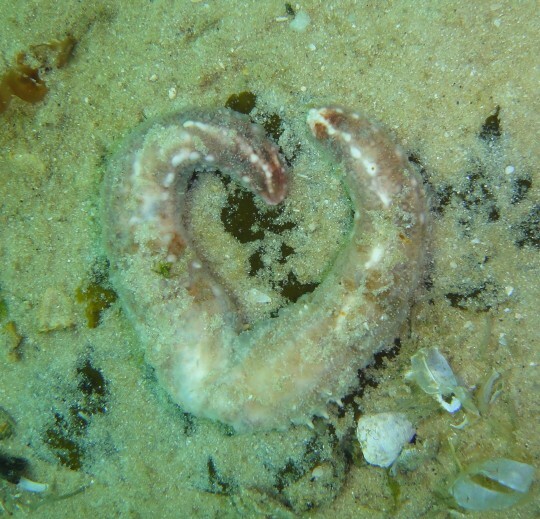 You can also see some photos of one of the crabs from Sea-Change here (facebook), taken on 22 January in False Bay. 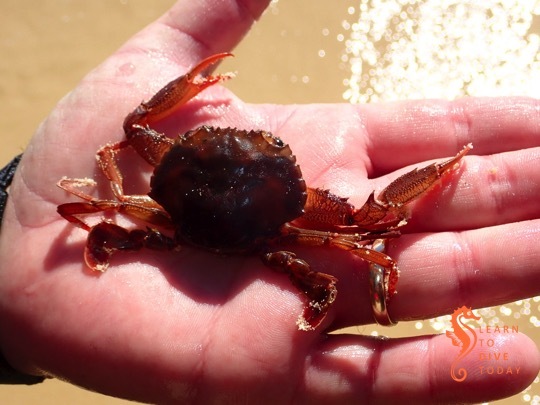 At the same time as these social media posts, there was an influx of small, red crabs on the other side of the Cape Peninsula, at Long Beach in Kommetjie. (But more on that in another post.) Two Oceans says that Smith’s swimming crabs were first described in False Bay in 1838, and then again in 1978, 1983, and 1993. This facebook thread suggests that they may have been last seen off Muizenberg around 2005-2006. I read more about Smith’s swimming crab in two papers: this one (Romanov et al), from 2009, and this one (Van Couwelaar et al) from 1997. The more recent paper updates many of the findings of the earlier one. Both teams of scientists behind these papers used trawl data from pelagic cruises to learn about the distribution and life history of these crabs. Smith’s swimming crab is a pelagic crab that spends the vast majority of its one year, monsoon-driven life cycle in the water column. They are endemic to the western Indian ocean, and are usually found in the area bounded by the Arabian sea (which is west of India) and the latitude of Dar Es Salaam in Tanzania (about 7 degrees south of the equator), and from the east African coast, across east to the Maldives. They may congregate in huge patches, larger than tens of square kilometres, and may reach a biomass of more than 130 kilograms per square kilometre. These swarms are densest between June and September. During July, their concentration can peak at more than 15,000 individuals per square kilometre. The crabs congregate on the seafloor of the continental shelf during the months of September to December, mating late in the year. 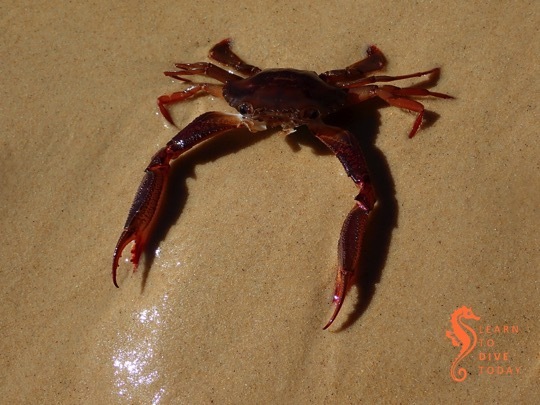 No adult crabs are usually seen between April and June (Van Couwelaar et al speculate that the adults die after breeding), at which time, after metamorphosis, the swarms again become apparent in the western Indian ocean. The crabs grow to about 7.5 centimetres carapace width. The crabs seem to perform a diel migration, moving deeper in the water column during the day (down to 350 metres’ depth), and returning to the surface at night. They swim continuously and are voracious predators in order to support the high metabolic demand created by this constant activity. They are able to regenerate all their limbs except for their swimming legs (Van Couwelaar et al deduced this in much the same way as Abraham Wald decided which parts of World War II bombers to reinforce – no crabs with partially grown swimming legs were caught in their trawls). These crabs are important prey for yellowtail, as for other pelagic fish species such as blue sharks, yellowfin tuna and bigeye tuna. The fishermen of False Bay observed that they made excellent bait. So what brings Smith’s swimming crab this far south? False Bay is way out of their range. This paper (Chapman, 1988) suggests that prior arrivals of these crabs on our shores have co-incided with weaker than usual summer south easterly winds (which has definitely been a feature of late 2018 and the start of 2019 – we had a gloriously wind-still summer for the most part) and the westward movement of warm water containing the crabs. We did have a spell of unusual westerly wind just prior to these crabs’ arrival. A fascinating 1984 paper by George Branch describes a temperature anomaly during the summer of 1982-83. This particular Cape summer was characterised by very little of the typical south easterly winds, leading to reduced upwelling, and relatively high sea temperatures (Duffy et al, Effects of the 1982-3 Warm Water Event on the Breeding of South African Seabirds, 1984). The exceptionally warm water on the south and west coasts of South Africa caused mass strandings of some tropical animals (such as portuguese man ‘o war), mortalities of others (such as black mussels), changes in abundance of some species, and extensions of some species’ geographic range. For example, an exceptional number of juvenile turtles washed up on the beaches of False Bay, several months before the usual start of the usual turtle stranding season (which is, very loosely speaking, March-July). Prof Branch records that large numbers of healthy, adult Smith’s swimming crab washed up at Cape Hangklip, and smaller numbers at Boulders Beach, Strand, Milnerton and Blouberg. 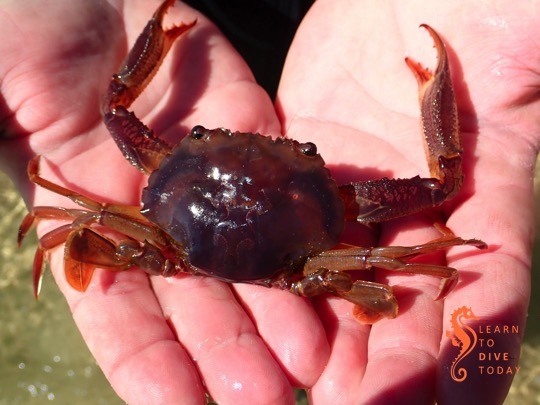 About 62% of the crabs were female, and many of them survived in aquaria for some time after stranding. 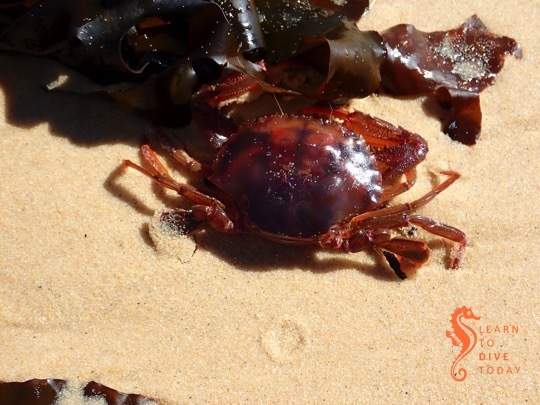 In short, it seems that we had our own little temperature anomlay, however brief, in early 2019, and the pulse of warm water brought with it these rarely seen (in Cape Town) crabs. What luck to spot this unusual visitor! There are some lovely pictures of Smith’s swimming crab, healthy and in mid water, taken off Tanzania, here. 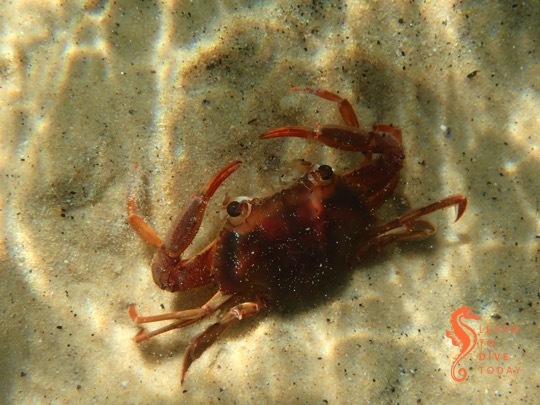 Posted on 20 March 2019 20 March 2019 Author ClareCategories Aquariums, Beach, Crabs, Current, Fish, Fishing, Harbours, Sharks, Shore diving, TurtlesTags scienceLeave a comment on Hello, Smith’s swimming crab! 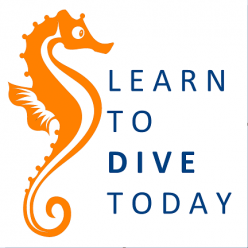 I would love to be writing to you, claiming a weekend ahead with stunning dive conditions…. But I am not. The week has had some looooong period large (i.e. Dungeons) sized swell. Although the swell drops off for the weekend, the wind (mostly northerly) and its strength (strong), don’t look all that great. 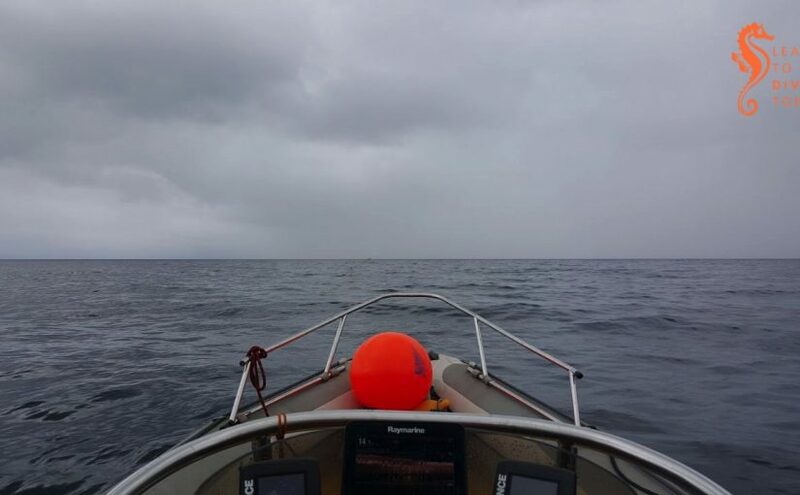 I am out on the boat tomorrow and the conditions should be the same for Saturday so if it’s good… I will change my plans, otherwise it is most likely going to be a dry weekend. If you want the option of diving based on tomorrow’s conditions, let me know. What to do if you find a stranded sea turtle? A tiny little chap was found at Kommetjie this past week. If you find a stranded turtle, keep it dry, and transport it as soon as possible to your nearest turtle rescue point. If you’re in Cape Town, this is most likely the Two Oceans Aquarium directly, or the Shark Spotters info centre at Muizenberg, who will make sure the turtle gets to the aquarium for rehabilitation and future release. Read more about what to do on the Two Oceans Aquarium website, here. I have been late in coming to this book, which was published about five years ago. George Hughes is a world-renowned, South African turtle scientist whose work has done much to ensure protection for sea turtles in the southern Indian Ocean. He was the guest speaker at an event held at the Two Oceans Aquarium to celebrate the release of Yoshi, the loggerhead turtle who spent over 20 years at the aquarium and is now powering along the Namibian coastline in rude health. 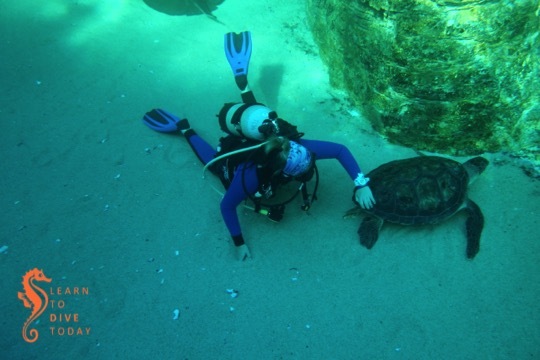 Dr Hughes was CEO of the Natal Parks Board and then Ezemvelo KZN Wildlife, but Between the Tides relates his early career as a student looking for turtles along South Africa’s wild north east coast, in places that today support thriving dive and fishing charters. His legacy of turtle research continues. 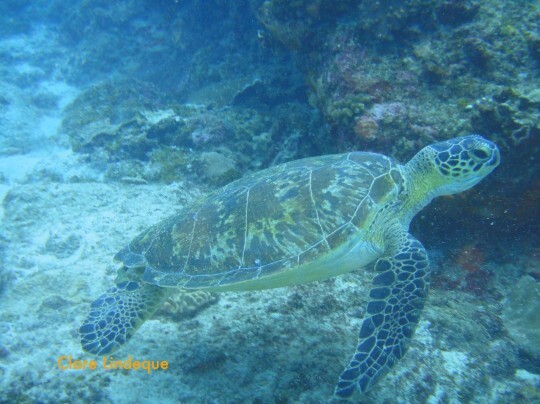 Turtle surveys were conducted around Madagascar, the Comores, Reunion, the Seychelles, and on the Mozambique coast. 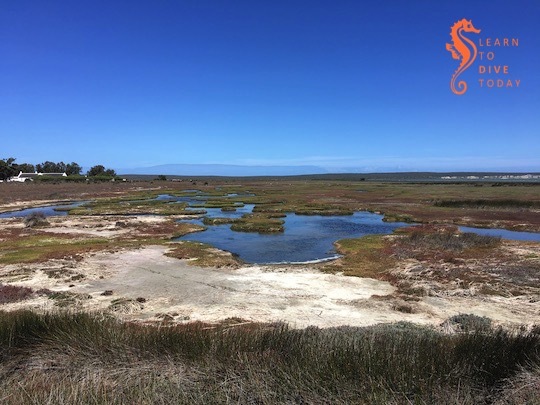 The fact that the iSimangaliso Wetland Park now exists, offering a protected and well-regulated breeding environment for three species of turtles (loggerhead, leatherback and green – discovered there in 2014) is thanks to the early and persistent work of Dr Hughes and his colleagues. Turtles were first found nesting on this piece of coast in 1963, when it was still completely wild and mostly neglected by the authorities. In this book Dr Hughes recounts the development of the tagging program that he started, in which over 350,000 hatchlings were flipper tagged and/or marked over a period of 31 years. Only about two out of every 1,000 hatchlings survive to return to the area in which they hatched, to breed. Female loggerheads are estimated to reach maturity around the age of 36 years, during which time they navigate an ocean of threats. This makes every surviving hatchling incredibly valuable. If you find a baby sea turtle on the beach (this is the time of year when they start washing up), here is what you should do. The most important thing is to keep it dry, and to contact the aquarium as soon as possible. Dr Hughes also discusses the sustainable use of sea turtles (for example, for food), something which I’d never thought about and which for that reason is fascinating – and very challenging to come at with an open mind, and appreciating the viewpoints of a scientist who has been steeped in turtle research for most of his life. 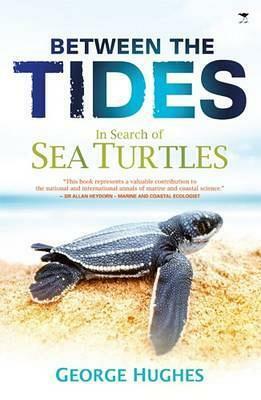 This is an excellent, proudly South African marine science book, written to be accessible even to those who aren’t turtle fanatics a priori. Highly recommended. Get a copy of the book here (South Africa), here or here. We launched yesterday and had pretty good conditions in False Bay at Fan Reef and the northern pinnacles of Roman Rock. It was grey and rainy, but great to be out on the bay. I’m going to count on the strong south easterly wind tomorrow cleaning up the Atlantic. The very southerly swell on Saturday will not be felt as strongly in Hout Bay, so we will most likely go there for dives. I’ll check the water colour tomorrow afternoon and confirm the final destination. If you want to be on the boat, let me know. Don’t forget that Diversnight is coming up next weekend, on Saturday 4 November. There is no charge for the dive, and the more the merrier. If you need to rent a cylinder or any other gear, please let me know in advance (i.e. not next Saturday)! Yoshi, the loggerhead turtle and undisputed star of the I&J Ocean Exhibit at the Two Oceans Aquarium, will be released soon. The aquarium is hosting a farewell event for her in November, with turtle experts and aquarists as guest speakers. More information here. The I&J Ocean Exhibit is the largest tank at the Two Oceans Aquarium, and has been open since mid-2016. It features a full 10 metre long tunnel, and is home to Yoshi the turtle, two green turtles, bonito, musselcracker, a guitarfish, some rays, and several other species. Watching the animals being fed at 12pm on a Sunday is a highlight of my monthly shift at the aquarium. I needed to dive in the tank, and Tony and I were lucky to be escorted by the wonderful Angie, who has been a Divemaster at the aquarium for several years. The dive is easy: the tank is shallow, warm, and the visibility is to all intents and purposes limitless. Angie pointed out that in an out of air situation, we’d just do a CESA to the surface. (This makes the aquarium perhaps the only location you’d use this skill in its pure form…) The animals aren’t dangerous, but they need to be respected, and the soft acrylic windows pose a particular challenge as a careless bump with some dive gear would scratch them from the inside. The green turtles are special. 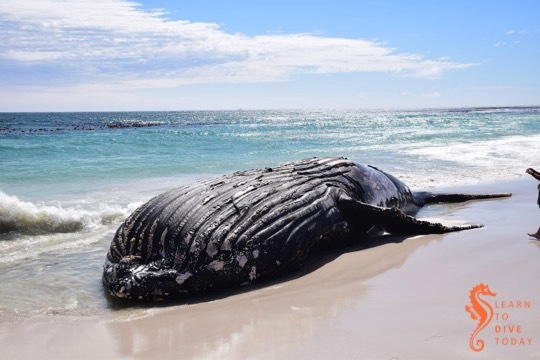 Bob was found in poor shape on the beach at De Hoop when he was the size of a dinner plate, and after several months in intensive care, regurgitated a quantity of plastic, including ribbons and balloons. Now, he is friendly and very attached to humans – he especially loves to have his shell tickled, and wriggles from side to side in appreciation. As a result of the amount of time he spent in veterinary care, he will stay at the aquarium for his own safety. Sandy was most likely struck by a boat propellor near Witsand at the mouth of the Breede river. The scars are visible on her carapace in the photo above. She was recently discovered to be definitely female (turtles are tricky). She’s not quite as interested in humans as Bob is, but she was mesmerised by her tiny reflection in Tony’s camera lens, and approached closer and closer to examine it. In addition to the turtles, Tony enjoyed the fantastic giant guitarfish, and spent much of the dive looking for it. The rays are like puppies, full of youthful exuberance and energy. The schooling fish mostly keep out of the way of the divers, near the surface of the tank, but are a treat to be close to. We last dived in the aquarium a couple of years ago. The kelp forest, which was an enormously enjoyable dive, is currently closed for renovations but will be re-opening soon. The new shark exhibit will also be open for dives soon (it is already open for looking at, with nine ragged tooth sharks in residence). Meanwhile, the Ocean Exhibit provides more than enough diversion on a day that doesn’t offer good enough weather for a sea dive. I’m back from an overly lengthy blogging hiatus (sorry) to resume a function that I’ve performed once or twice in the past. Fortunately I have had octopus on my mind and had already started posting again, and so we aren’t doing a standing start. The new legislation this time is actually two documents that were published in the Government Gazette on 30 May. Before we get into these two most recent documents, however, it may be instructive to look back at the original act that they refer to. The act in question is the National Environmental Management Act: Biodiversity, number 10 of 2004 (pdf full text). We will call it NEMBA for short. This act is a framework which provides for the management and conservation of South Africa’s biodiversity, as well as the protection of species that require or deserve it, the fair apportionment of benefits that may arise from the country’s biological resources, and the establishment of SANBI. The important sections of this act for us, right now, are sections 56 and 57. Section 56 empowers the Minister of Environmental Affairs to publish in the Government Gazette, from time to time (at least every five years or more often than that), a list of critically endangered, endangered, vulnerable, and protected species. A species may be protected but not endangered; a case in point is the Cape fur seal. I am not knowledgeable enough to state confidently that the extract above is using a set of widely accepted definitions here. However, this list of definitions from (critically) endangered to vulnerable does look a lot like the IUCN categories for classifying species at risk of extinction. The next section talks about activities involving species that fall into one of the categories defined in section 56. Provision is made here for the Minister to define activities that are “restricted”, and section 57 specifies that if an activity is restricted, a permit is required in order to perform it. The definition of restricted may vary from species to species (but I am getting ahead of myself). Finally, section 97 of NEMBA, which is on page 40 of the PDF file I linked to above, empowers the Minister to make regulations dealing with a large number of matters, mostly permits, and threat-minimisation for threatened ecosystems. This is a very important definition (from page 10-11) as it essentially determines what is legal and what is not in terms of the act, and one that I think is perfectly reasonable. You can still take photos of and dive with seals, turtles and most sharks. Whale sharks and basking sharks are not to be bothered up close, though. Notice also that we now have a definition for harassment of dolphins; it has been my understanding (perhaps incorrect) that until now there has been a loophole in that there has been no legal prohibition on approaching dolphins in a boat, whereas boats must stay at a distance of 300 metres away from whales. I can think of other things I have seen boats doing with dolphins – such as corralling them by speeding in a circle at full throttle – that also seem like harassment to me, but don’t quite fit this definition. But I think this is a start. Also, no swimming with dolphins – for profit or not. The regulations go on to state that their purpose relates to the permit system provided for in NEMBA, to registration and legislation of facilities like wildlife breeders and rehabilitators, and to the regulation of activities defined as “restricted”. The regulations also provide some further stipulations regarding boat-based whale and dolphin watching, and white shark cage diving. It is specifically stated that the regulations are to be applied in conjunction with CITES, international regulations which circumscribe international trade in wildlife (and in this way achieve protection for some species). Page 17-18 defines restricted activities (in other words, activities which you either cannot do at all, or for which you need a permit). Page 18 further clarifies that a permit is required in order to carry out a restricted activity, and the regulations go on to define various types of permit in terms of their period of validity and other criteria. Page 38 mentions that in the case of a captive breeding or exhibition facility, no whales, dolphins, seals, sea birds, white sharks, basking sharks or whale sharks may be introduced from the wild. If I read this correctly, this puts paid to the restocking of dolphinariums with wild-caught animals. Also a start. If you are interested in this aspect of the regulations, I would encourage you to go through the document yourself. There are some more good provisos aimed at the regulation of wildlife sanctuaries, but that isn’t my main area of interest here. You may have picked up that some of the activities defined as restricted may be required actions in the event of a whale stranding, for example, or the entanglement of a seabird or turtle in fishing lines. What to do? The regulations make specific provision for the cases in which one might need to handle, move, or even kill an animal listed as threatened or protected. Only those individuals or organisations which are in possession of a permit may perform any of these restricted activists; this largely precludes members of the public from assisting in any significant way at whale stranding, for example. I don’t think this is necessarily a bad thing. Finally the regulations turn to white shark cage diving, and boat-based whale and dolphin watching. I am not sufficiently familiar with the existing regulations of these two industries to comment on what is different or new here, but it is interesting to read through the provisions for each. They seem well regulated. Free diving with white sharks is specifically forbidden. 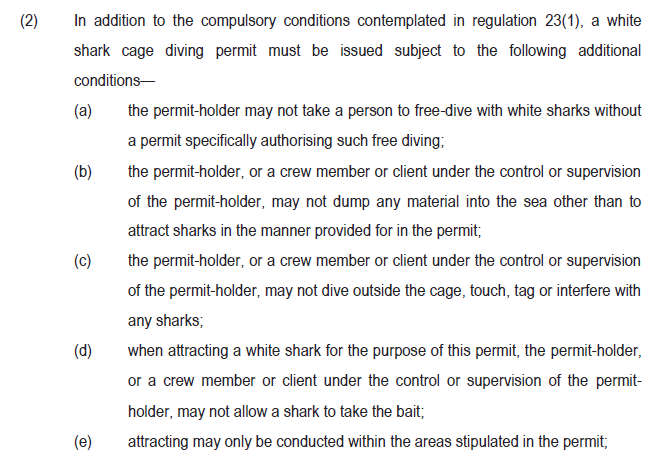 Additionally, as item (e) below states, even if an operator is in possession of a cage diving permit, this does not permit them to chum (“provision” or “attract” sharks) anywhere else. 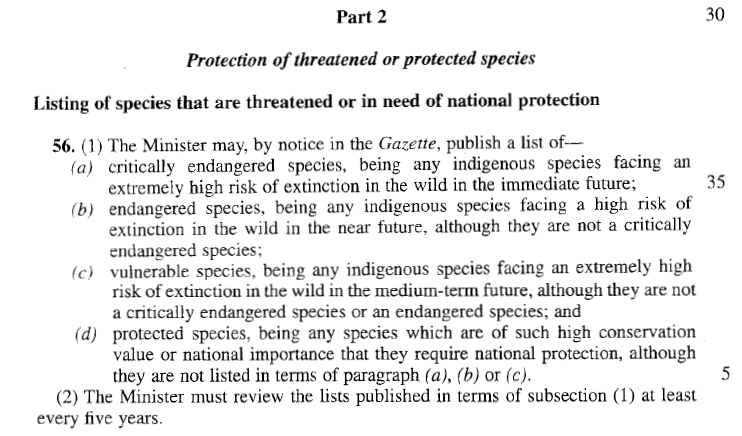 The second part of the Government Gazette publication on 30 May is a list of threatened and protected animals. 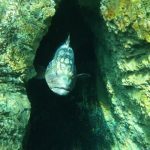 This list mentions fish, whales, seabirds, turtles, and even hard corals. This document (pdf – page numbers below refer to this file) has a very particular tabular layout. 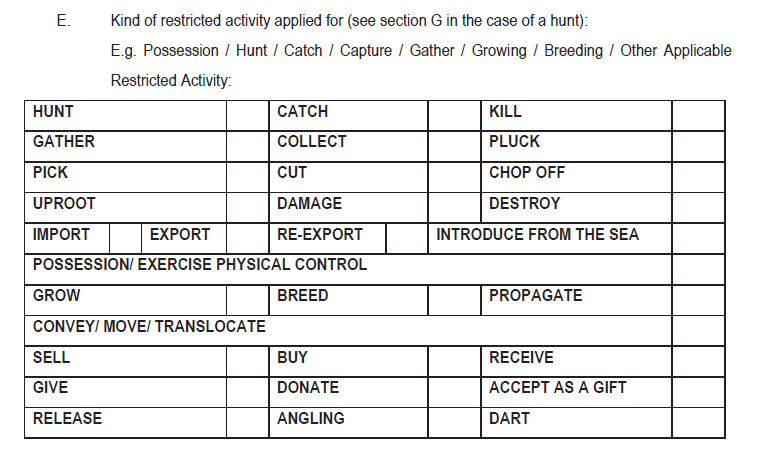 There is very little variation in the list of restricted activities (column 2) across all the animals and birds; whales have the most interesting list of exempt activities (column 3), which is why we will look at them as an example. This table is from pages 138-139. Click to enlarge. 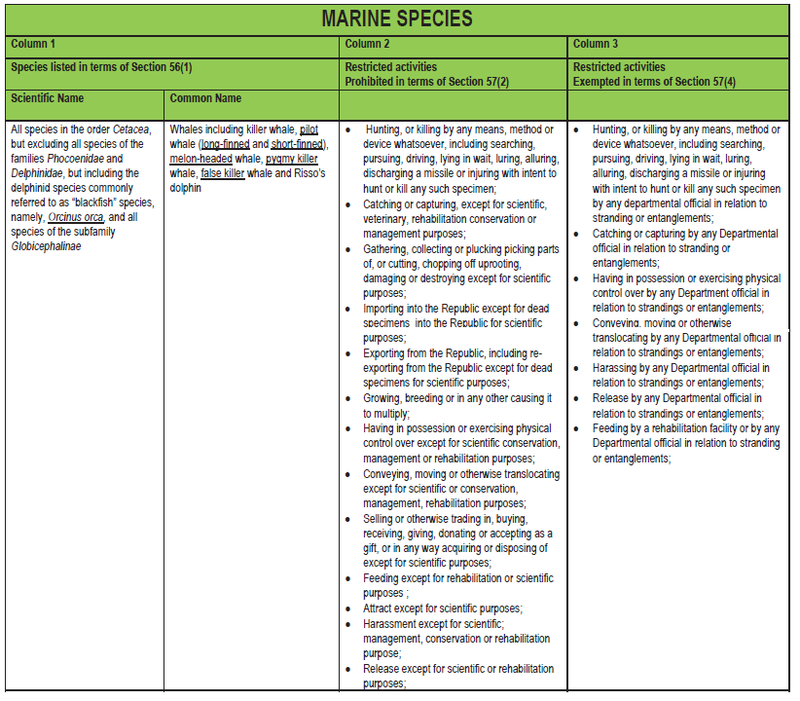 Column 2 of the table above defines all the things you can’t do to whales – the “restricted activities”. Column 3 lists a whole lot of terrible-sounding things that can be performed under certain exceptional conditions, in the event of a whale stranding itself on the beach, for example. This is a good time to practise using the definitions. Notice that column 3 allows “harassing [of the stranded whale] by any Departmental official.” This does not mean that someone from Environmental Affairs is allowed to go and prod a stranded whale with a stick, or throw sand at it. 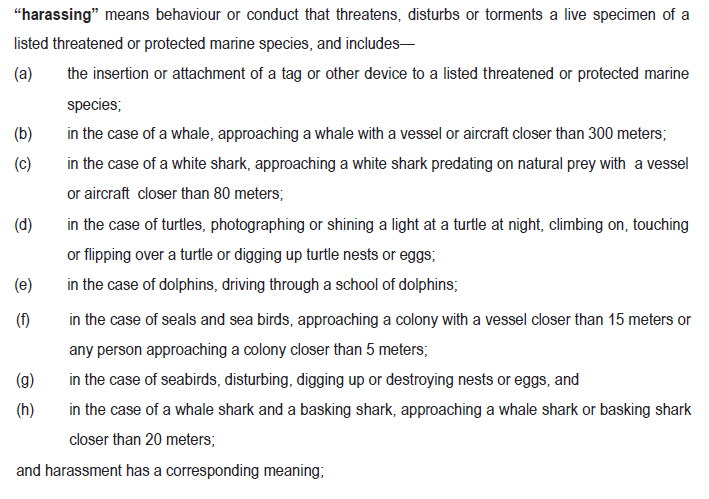 We are talking about harassment in terms of the legal definition above, and this may include “disturbing” the whale, or approaching closer than 300 metres on a boat, for example. If you’re interested to go and look, the pages of the species list pertaining to seals and their relatives is on pages 141-144. 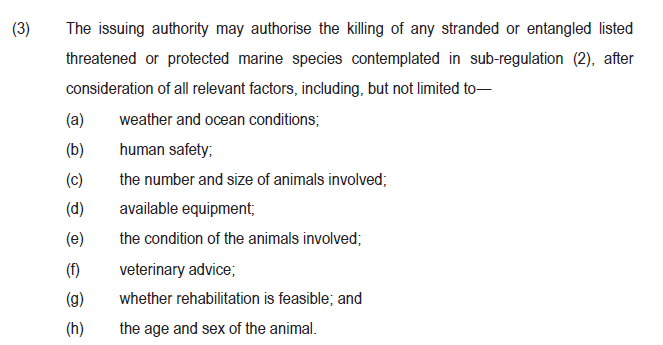 There are no special provisions to worry responsible water users, and the definition of seal harassment as shown above (approaching a colony closer than 15 metres in a boat or 5 metres as a human) is I think entirely reasonable. Finally, here’s an extract from the permit application form. I include this to show you that all the restricted activities for which permits are required are pretty extreme, and not things that your average recreational diver would reasonably want to do. This has been long, but I hope helpful. The regulations aren’t open to comment (I think I may have missed that earlier this year or last year… oops), they are final. Energy and advocacy is best directed towards things that the diving community can have an impact on as a collective voice, and in ways that will have a chance of success. In other words, perform actions out in the real world, and align yourself with organisations that do real, scientifically informed conservation work. I’m sure you all can think of other ideas, but I do have one suggestion regarding a species that isn’t listed here. 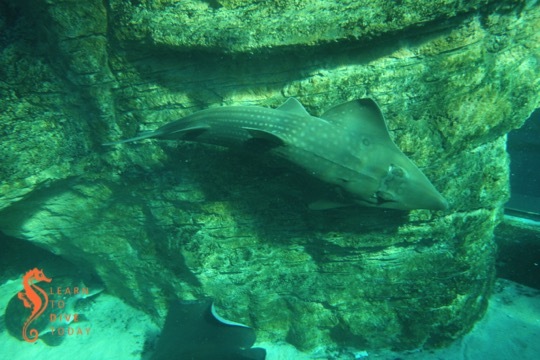 The sevengill cowsharks that we see at Millers Point aren’t protected (they are “data deficient” on IUCN Red List). If you feel strongly about them, can I suggest as an easy first step, writing some letters (the letter in that link is out of date due to ministerial shufflings, and shark finning in South African waters is banned but this is poorly enforced – but you get the idea). Once again here’s a link to the regulations, and here’s a link to the species list. Both are pdf files, hosted on this site in case the Government Gazette links above break one day. The weekend outlook is not that easy to call. A 4 metre, long period swell is due tomorrow. How much of it arrives and precisely when is difficult to say, as the forecasts on the more frequently used weather sites are quite different. 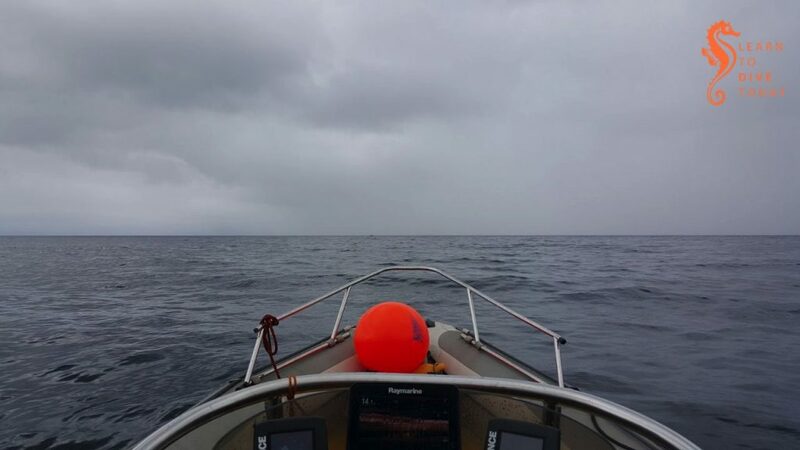 Hout Bay was surprisingly flat today when I went to take a look (the boat had its annual SAMSA survey today) and False Bay had far more swell than expected. For both days this weekend the wind is favourable, so it all really hangs on the swell. I would like to launch either Saturday or Sunday but will make that decision midday tomorrow. If you’d like the option of diving, reply to this mail, sms or Whatsapp me. 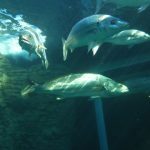 Last weekend we dived in the I&J Ocean Exhibit at the Two Oceans Aquarium. It’s an experience that comes highly recommended. The picture above is of Sandy, a rescued green turtle whose shell was badly damaged by a boat propellor, looking at her reflection in my camera lens. The weekend looks good for diving. We’ll be boat diving on Sunday. If you want to join us, you know what to do! It’s that time of year when turtle hatchlings get caught up in currents that bring them to Western Cape shores, where it’s too cold for them to survive. If you find one on the beach, please keep it dry and warm, and get it to the Two Oceans Aquarium as soon as possible. Read more about what to do on the aquarium blog here, and here.